to your Road to the Good Life! 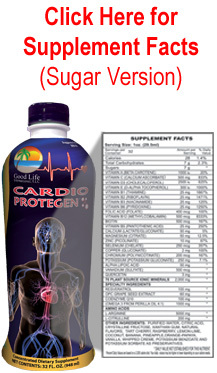 Good Life Mega Cardio Health Plus is now Cardio Protegen™. To prevent confusion and give Good Life’s Cardio products a distinct brand, we have trademarked the name “Cardio Protegen™”. Protegen is derived from Latin and Spanish roots and the verb Proteger which means to “protect or support”. When researching possible names we wanted to relay the function of our Cardio product and feel that Protegen does just that. With over 100 active ingredients in Cardio Protegen™ it doesn’t take long to understand why we choose this word for our brand. Look at the ingredients and see why this premium product attracts customers for life. 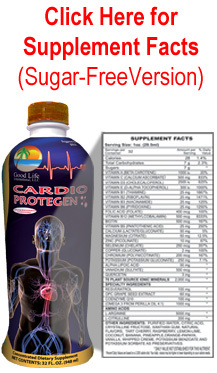 For those that need extra L-Arginine, Cardio Protegen™ Booster provides the amino acid blend without the vitamins. This product can be taken anytime during the day and is a perfect compliment to Cardio Protegen™. If you've been looking for a power-packed product that can make a difference in how you feel and can save you money, you'll love Cardio Protegen™. Cardio Protegen™ is a powerful blend of over 100 Nutrients including; 70 Plant-Source Ionic Minerals, 12 Essential Vitamins, Omega 3 Fatty Acids, as well as many other Anti-Oxidants. Each serving contains 5000 mg of L-Arginine, 100 mg of CoQ10 and 100 mg of Resveratrol the antioxidant equivalent of 115 glasses of red wine! One 32 oz. 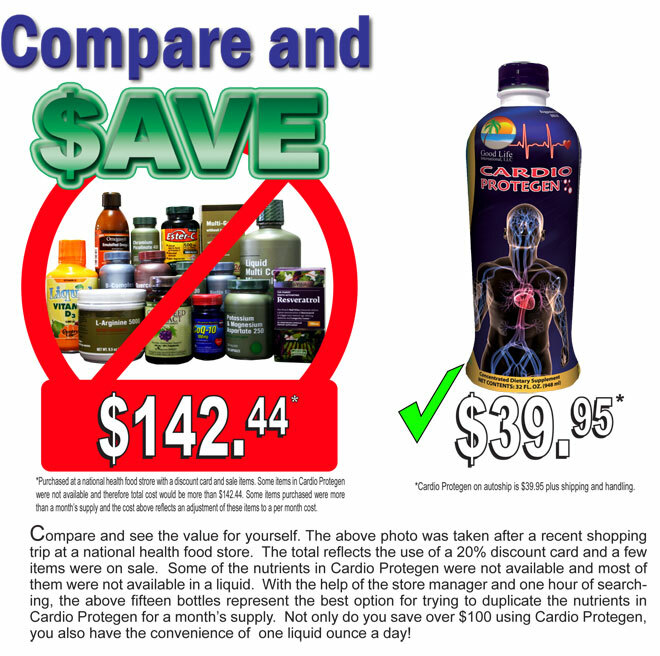 bottle is a convenient month's supply of over 100 highly synergistic nutrients for less than a dollar-fifty a day - probably less than most people spend on that cup of coffee or soda they drink every day! Resveratrol ( 100 mg/oz ) Resveratrol is the antioxidant found in the skin of red grapes and is a constituent of red wine. Each ounce of Mega Cardio Health Plus™ contains as much resveratrol as 115 glasses of red wine. the convenience of one liquid ounce a day! Adults: 1 ounce daily. 1 oz. = Two Tbsp. ; one tbsp. = 3 tsp. USAGE: SHAKE WELL BEFORE USAGE. Natural separation may occur. Mix one ounce daily with 1-8 ounces of water or juice if preferred. Best taken twenty minutes prior to eating. If stomach upset occurs, take with meals. Refrigerate after opening. Store in original container. Protect from heat, light and moisture. Avoid direct sunlight. Store unopened bottles between 56°- 86° degrees Fahrenheit (15°- 30 C°). WARNING: Not for use by pregnant or lactating women, or persons who have have had ocular or brain herpes. High levels of L-Arginine may cause re-activation of of latent herpes virus in a few susceptible persons. If this occurs, discontinue use. Not recommended for individuals currently taking Sildenafil Citrate (Viagra). Discontinue if allergic reaction occurs. Keep out of the reach of children. *Disclaimer: THESE STATEMENTS HAVE NOT BEEN EVALUATED BY THE FOOD AND DRUG ADMINISTRATION. THESE PRODUCTS ARE NOT INTENDED TO DIAGNOSE, TREAT, CURE OR PREVENT ANY DISEASE. All information presented by Good Life International, LLC is for educational purposes only. The statements on this web site have not been evaluated by the FDA and are not intended as a substitute for a consultation with your physician. In case of medical questions or uncertainties, the reader is encouraged to seek the advice of his/her own physician or health care practitioner.